In our house, Chris is in charge of cooking and I am in charge of cleaning. With his Italian background, we eat a lot of pasta. So, it's no surprise that when I asked him which of Chef Michael Smith's classic recipes with a twist he wanted to try that we ended up with a pasta dish - the Speedy Tomato Pasta to be exact. When you have an impatient toddler (and her impatient mother) waiting to be fed, you want to cook quickly but still satisfy. With this recipe, Chris (and of course, Chef Michael!) did both. 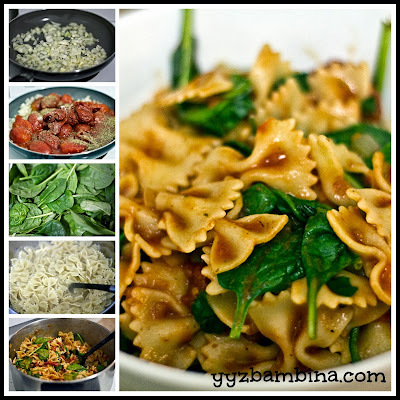 I wasn't sure how Hannah would react to spinach in her pasta, but she loved it! Unfortunately, I am the dishwasher in our household as we do not have an, um, a dish washer. But I can vouch that Bounty helped me clean everything from Hannah's face to our kitchen counters! Would you like to give classic recipes a twist? By entering the following contest you are accepting that if you win your contact information will be shared with a P&G PR and shipping agency for the purpose of mailing your prize. Please allow 4-6 weeks from the contest closure date to receive your prize. This giveaway may appear on other blogs as part of the #PGmom program. However, to be fair, you can only win once per giveaway. If your name is chosen more than once, another winner will be selected. All winners must be from within Canada excluding Quebec. Valid entries only. Contest ends Saturday, October 26, 2013. For further contest rules, refer to the Terms and Conditions within the Rafflecopter. To liven up dinner a bit... sometimes things get boring, a new twist could be fun! Recipes can get a bit boring after awhile, so it is nice to be able to add something different to them and give a different taste. To taste a different flavour for the recipe. I find myself in a cooking rut and need an intervention big time! I need to try some different things, I just don't have that talent to put something else into the same boring foods. I like trying something new so adding a twist to a classic recipe allows me to do that without trying to come up with a fresh recipe all together. Because there are only so many ways you can cook a potato before it gets boring. To get us out of the same recipe rut that we often get into at our house. I'd like add new ingredients and experiments with classic recipes to create new dishes or making lighter alternatives. I want to twist classic recipes because I usually end up doing that any way as I love to cook. I would love to twist classic recipes,because I am stuck in a rut,making the same thing over and over..lol..would love some new ideas! I want to twist classic recipes so we have have something old be new again! Sounds perfect to me. my mom was a salt and pepper kind of cook. i'd love to be able to cook some of those fav meals but a little something extra. broaden my palette. I need to change it up at meal time...I tend to cook the same dinners over and over. A twist up of the classics would be great! To change it up. To discover new dishes by changing ingredients. to add a little surprise! I would like to try something different, get kinda of tired serving the same thing over and over, at least it feels like that's what I'm doing. 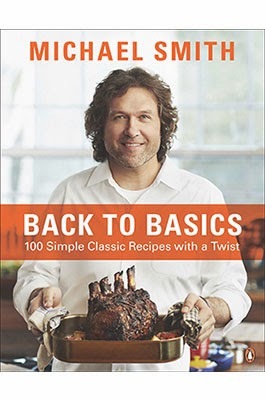 I would like to twist classic recipes because I am not very creative and usually can't think up different things on my own, I would love to have this book. I like to add a little something of my own! To spice up my cooking routine and make it more enjoyable! I like to twist classic dishes to make them healthier. To give them a fresh taste and to enhance the recipe rather than just always having the "same old, same old". It's nice to have something new! I get bored of eating the same thing over and over and like to add a little something to make it different. I would love a recipe(s) that add a twist to the classic lasagna. I see so many ideas out there, but when it comes to a few hours before dinner, I am not prepared or have already forgotten. I am tired of serving the same thing all the time and when ever I ask what do you want for dinner? Everyone says I don't know. Time to change it up a bit. Classic recipes are great - but I like trying new things!